Musical/Rhythmic – Imagine a group of children spread out along the faces of a pyramid net, taking turns to bounce on their ropes in sequence. Sounds like fun, but it also helps to develop a sense of rhythm in children, especially when they adapt their speed or incorporate singing into their games. Intrapersonal – Part of the beauty of free play is that children decide for themselves how they want to interact and play with the equipment. As such, they are free to create their own challenges, set their own goals and overcome fears. Imagine the sense of accomplishment when the child who was unsure of heights made it to the top of the net climber after his fifth visit. Interpersonal – We touched on how language is developed through play, but so many social cues are also learned at the playground. Learning to wait your turn, helping a younger child get onto a game, listening to the rules of a game, pushing a few friends on a Biggo swing, encouraging another child to come play on the net climber: these are all fantastic examples of the kind of interpersonal, social development that is typical in a playground. Naturalist – Some of us take being outside in proximity to nature for granted, but for some children in urban centres, the bit of grass and the lonely tree at the neighbourhood park might be their only opportunity to really be close to nature. Our flexible designs allow us to work with the natural shape of a space, be it slopes or trees, meaning that we don’t need to clear cut a flat box. This allows children and their parents to enjoy the playground equipment, as well as the natural beauty around them and the fresh air on their faces. 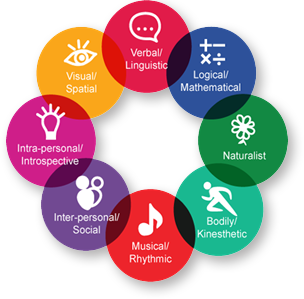 A Dynamo Playground can bring all of these elements together in one free-play space, allowing children to develop their multiple intelligences in a well-balanced park, but above all else, play and have fun. Interested in making a smart choice on your next playground? Reach out to Dynamo Playgrounds, and let’s get started on your next playground!